Are you looking for a cozy, relaxing cabin just feet from the Nottely River? If you are, then "Amazing Grace" is the perfect cabin for you. 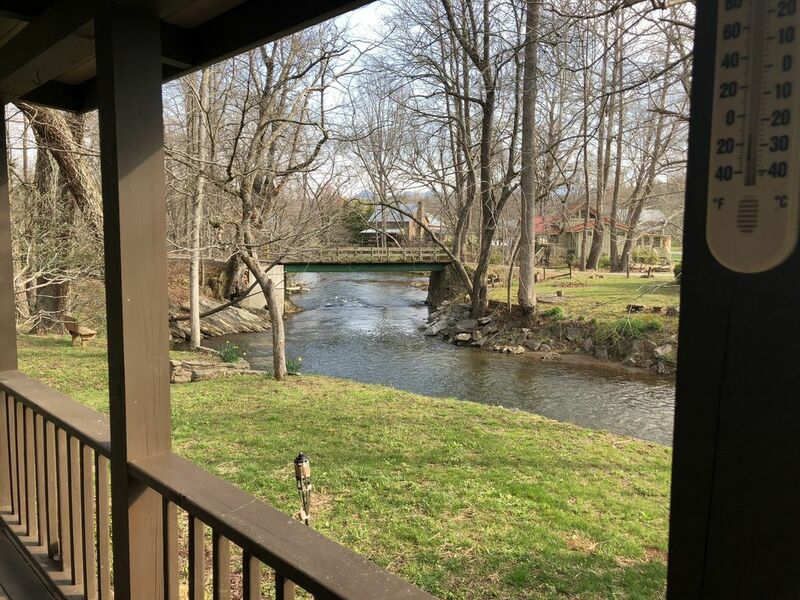 Bring your fishing pole so you can trout fish just steps from your back door, enjoy family time floating down the Nottely River, or spend the cool fall evenings relaxing on the wrap around porch/deck. This 2 bedroom/ 1 full bathroom cabin has been beautifully decorated with all new rustic furniture and has real pinewood floors in the kitchen, bathroom and living area. The master bedroom features a queen size bed and the 2nd bedroom is equipped with a full/twin size bunk bed. You can enjoy the gas log fireplace on those chilly nights while reclining back watching the 50 inch smart t.v. in the living room. The yard is large and level which is perfect for playing games, cooking out, or sitting around the fire pit. "Amazing Grace" is conveniently located off US Highway 129, 8 miles from downtown Blairsville, 30 minutes from Blue Ridge, and only 4 miles from Vogel State Park. There are plenty of activities close by to fill your days such as: hiking, rafting, ziplining, fishing, canoeing, boating, swimming, just to name a few. If you want a real treat at night, you can go back in time by visiting the Swan Drive-in Theatre located in Blue Ridge. If you are looking for a river front cabin that is minutes from hiking trails, waterfalls, mini golf, restaurants, and shopping, give Amazing Grace a try. Curtis and I have been married for 28 glorious years. We have a deep faith in Christ and are very involved in our church. We love going to see the Dawgs hunker down and spending time with family and friends. We both have a great love of the outdoors and nature. We love spending our down time at the cabin. Our retirement goal is to spend time traveling the U.S. in an RV part of the time and living at the cabin the rest of the time. We looked for a cabin for about 10 years, but nothing really caught our eye until we saw this place. The minute we drove up, we knew this was the cabin we had been searching for. We love sitting on the porch and watching the river, birds, and squirrels. At night, we love to look at the stars; on a clear night, the sky is filled with them. There is a wooden bridge going into the village which adds to the character of this wonderful place; it is fun to listen to the cars drive over it. Most cabins are difficult to get to, but not this one; it is located right off 129 and is close to so many interesting places. There are hiking trails, shops, restaurants, waterfalls, golf courses, national parks, etc. a short drive from the cabin. The cabin is only a few feet from the edge of the Nottely River. Located separately from living area. There is a parking space large enough to accomodate 2 vehicles. We stayed at Amazing Grace in celebration of my husband's birthday. The cabin is absolutely beautiful, very clean. Candy is a wonderful hostess. Thanks so much for a great stay. The cabin is charming and the scenery is exceptional. Everything about our stay was wonderful. There was a goodie basket waiting for us on arrival. Definitely will recommend to anyone looking for a mountain getaway. The location was fantastic. Cute cabin on a river, with a large yard. We enjoy going to state parks and we used it as our home base and traveled to several different parks in north Georgia, plus other places, like Blue Ridge and Brasstown Bald. It is close to Blairsville, so restaurants and any necessary shopping are close by also. The cabin was perfectly set up with kitchen basics, linens, etc. We loved the gas fireplace inside and the fire pit outside. A recent remodel was evident and a nice touch. My husband, two little boys, and I came for a little fall break. The cabin was just the right size and well stocked with everything we needed for the weekend. The owners even had a sweet goodie basket waiting for us! The cabin was so clean and the riverfront property was simply beautiful and so peaceful! The fire pit was stocked and ready for us to make a fire and my boys loved playing corn hole. The owners were very friendly and quick to respond. The entire trip was a pleasure! This cabin was ideal. Very clean with everything we needed for a relaxing stay. Candy, the owner, is amazing; so easy to work with. You will not be disappointed. We have never stayed at a cabin any cleaner than this one!! It was beautiful, clean, everything you need and next to all the fabulous waterfalls and hiking trails you want to explore!! Thank you for sharing your cabin with us it was truly a hidden gem! !